Share the Pow Wow experience with your family and friends. Join us the third weekend in September. Throughout the weekend, demonstrations will show traditional methods used by Haudenosaunee and Anishinaabec ancestors of the region for harvesting maple sap and converting it into delicious maple products. Stay tuned for themed Paint Nights happening throughout the year. This painting "Hummingbird" is by artist Moses Lunham from our June 2018 paint night. Artist Moses Lunham teaches these incredible participants how to create the colourful 'Moonlight Dance' during a Paint Night in Summer 2017. On February 16th and March 2nd 2019, from 10am?to 2 pm,?the Museum of Ontario Archaeology will be holding a Drum Making Workshop! 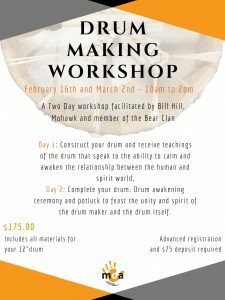 Facilitated by Bill Hill, Mohawk and member of the Bear Clan, participants will make their own custom 12″ drum. ?Registration and deposit?are required in advance, so please contact the museum by phone at 519-473-1360, by email?or via PayPal. Site leads are information about potential archaeological sites, recorded in the Ministry of Tourism, Culture and Sport’s Past Portal inventory of archaeological sites for use and reference by professional archaeologists. Ontario has thousands of unregistered archaeological sites that have never been entered into the Ministry of Tourism, Culture and Sport’s Past Portal inventory of archaeological sites. Many sites continue to be found by non-archaeologists who do not have access to the site inventory. There are currently no incentives or processes to encourage site lead entries in Ontario. To-date less than 50 site leads have been recorded. The Lead Legacy Project is designed to encourage the entry of site leads through a social event for archaeologists paired with a fundraiser for a worthy heritage cause or institution. Help us add 100 new site leads based on Wilfrid Jury’s 1930s collection and other sources at the MOA. By entering unregistered sites into Past Portal via the site lead process we can mitigate consequences to land management and heritage integrity. Students and professionals are welcome to drop into this pilot event anytime. Pizza, snacks and beverages will be provided. Please help us support this event!? 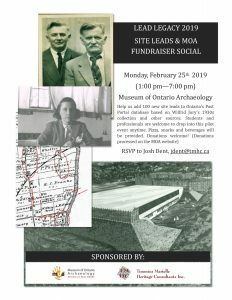 Donations will cover the cost of the event (i.e., supplies and refreshments for participants) with remaining funds allocated to the Museum of Ontario Archaeology’s other programs and operations. The Museum produces exhibits, school curricula and day camps, and stewards a growing collection of archaeological artifacts, documents and other media. The Museum of Ontario Archaeology is a registered charity. Would you like to hear about new exhibitions and events? Visit WikiFun.com for the latest events in London and area!